We’re building a chicken coop this weekend for our eight chickens. Well, a man is coming to build it—and we’re watching. Sometimes right up in the action and sometimes from the windows. 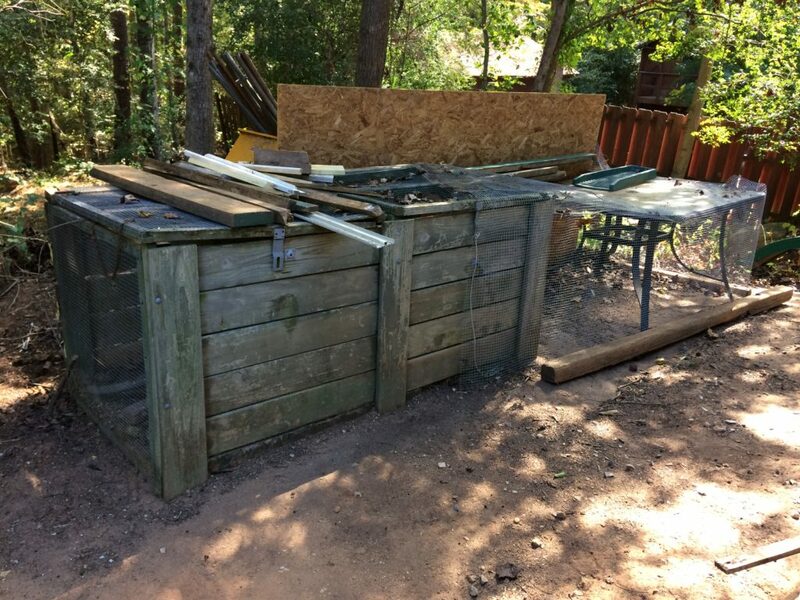 Our chicken coop situation started out pretty makeshift. I came home with a box of baby chicks and didn’t want to keep them in the kitchen. Isn’t interesting how we seem to get things done faster in life when it is because we don’t want something. It’s like that for me. Then I brought home ten more chickens (pullets, that were growing by the minute) and realized this situation wasn’t going to hold. 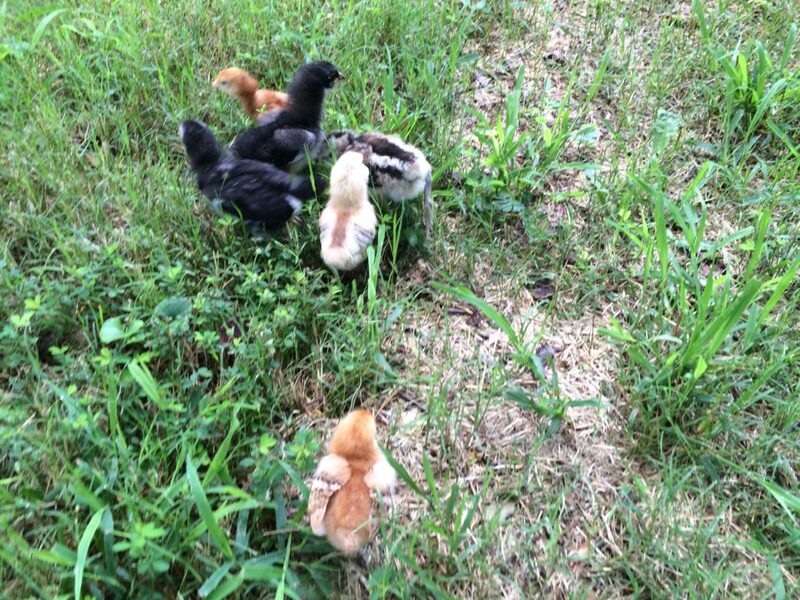 The makeshift coop was too small to keep them in except at night so they roamed the yard during the day. I was soon missing a couple of my small chicks and then another. Two more disappeared while I ran errands one day, including a larger chicken that I found disemboweled a few feet from the yard. 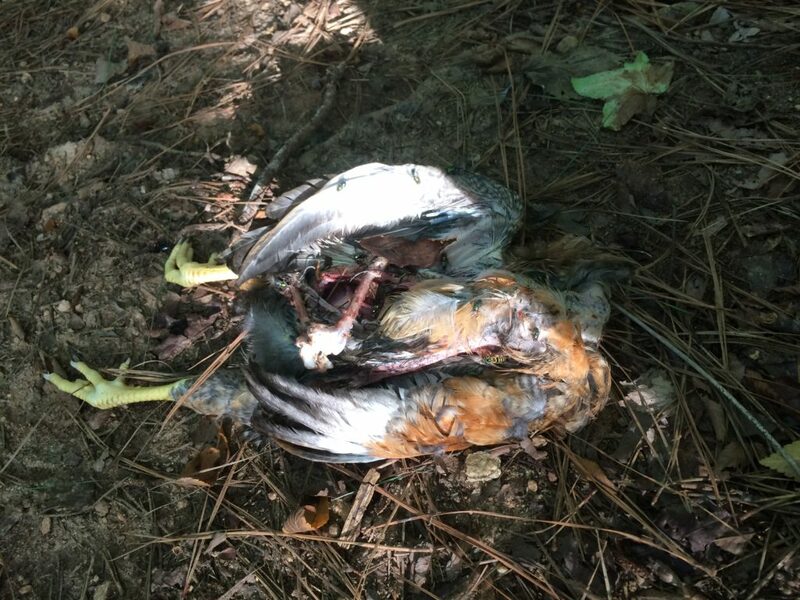 Do polite bloggers warn about graphic content? I’m sorry. I’ll go back and do that now. I felt so creeped out in my backyard because we back up to a big stretch of wooded land and I couldn’t identify the predator. My husband showed my carnage photos to a co-worker and this was deemed the work of a raccoon. 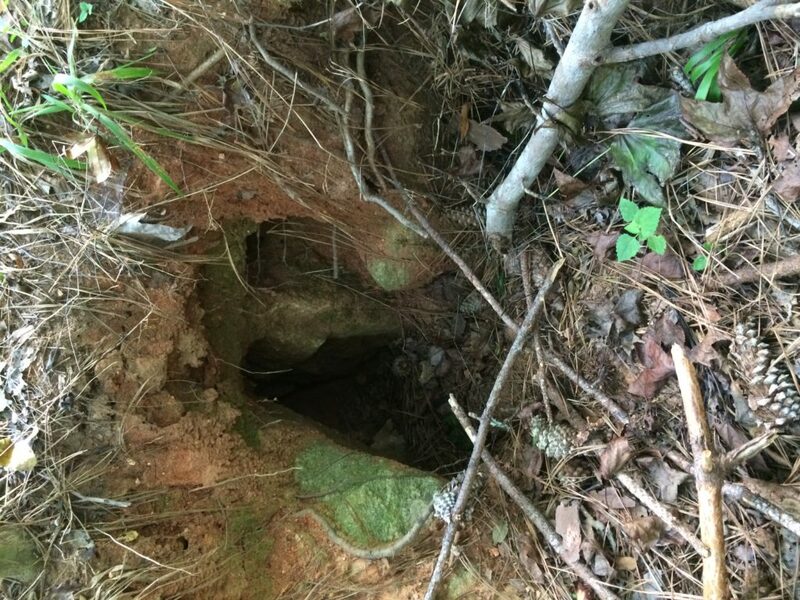 So I went all over the back part of our lot turning over chicken carcasses and tracing ribbons of entrails (that later disappeared), and plugging up holes that could be raccoon dens. I also checked the fences. It all felt very frontier woman like. But it wasn’t a gaze of masked bandits. And it probably wasn’t a lone coyote (that can leap a six foot border in a single graceful bound, catching several inches of air to boot) because there’d been no sightings. I hadn’t heard an owl. Or seen any sign of mink. And the neighborhood dogs hadn’t gone wild like they would if a fox were lurking about. After Googling these and other beasts of prey, I settled on it being a hawk. And I started looking up at the sky a lot more. Did you know those things don’t have to have big open areas to swoop down and take your chickens? They can also just land and casually hop around your yard until they see a chicken that looks tasty. And then they bite off the head and rip the thing to shreds. That’s when I was down to 11 poultry and saw a hawk flap away with one of my Rhode Island Red chicks. And I knew what I was up against, for sure. But I never wanted to see that again, so this happened. For my ten remaining birds. And I was too embarrassed to share it with anyone so you won’t find this image on my Instagram account. Nope. This is also the very cleaned up version from this morning when I was getting ready for our weekend project. 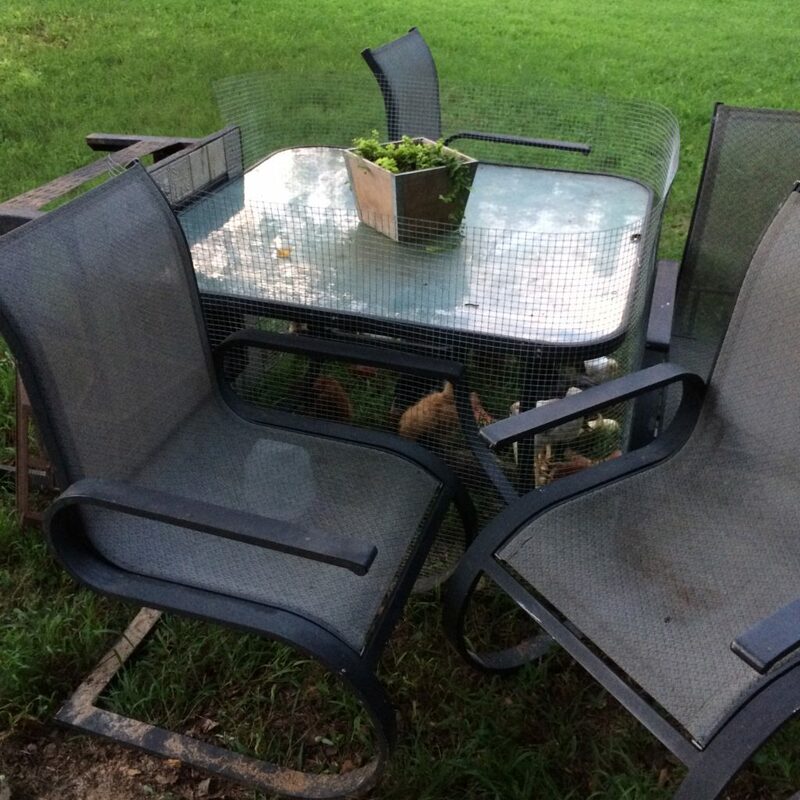 It was previously covered over with cardboard and weighted down with bags of play sand, along with the base of our umbrella table. It also had a lot more lumber stacked on top and pushed up all around it and a solid covering of crunchy fall leaves – but I’d be loathe to document that. Ever. 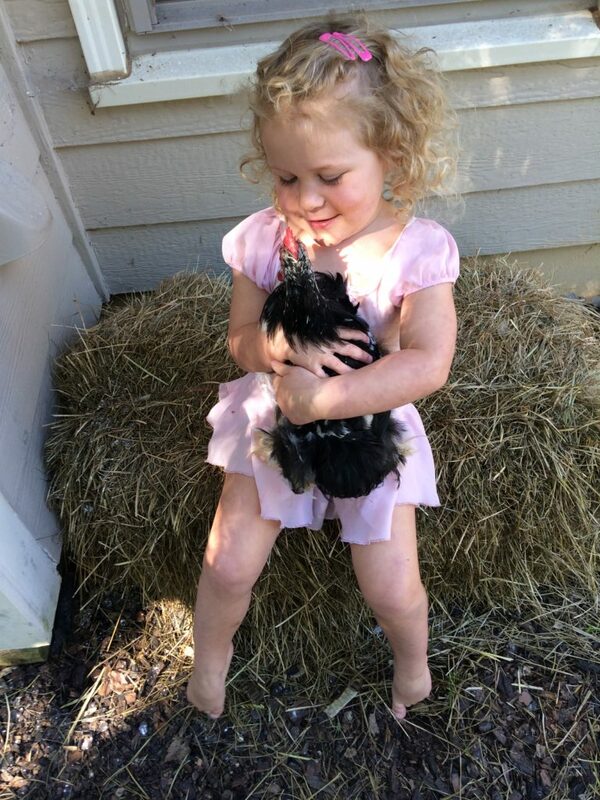 With this larger coop, I was letting my chickens out only with supervision. It was exhausting. Then I went on vacation and had to keep them penned up for five days straight whilst my husband fed them daily. I came home to a sealed pen with two dead chickens, picked clean. After this up-close and uncomfortable display of Survival of the Fittest, I had mixed emotions about my eight remaining savage chickens. I decided to let them roam free all day. 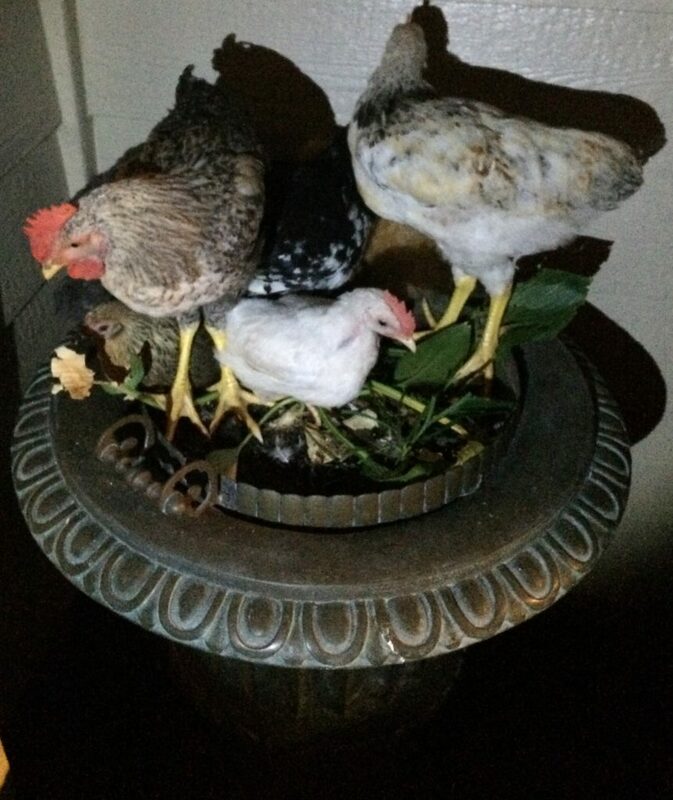 They started roosting on my porch every night at dusk. And I dutifully gathered them each night to the coop. Not gonna lie, this gets messy. Then I left town for again for a week and again my hero husband (and hero chicken-herder) got home late and crashed on the couch while the chickens ended up roosting overnight on our porch. They lived. And they survived the next night too. So we threw in the towel and let them be. One hundred percent free-range now for almost three weeks. And all eight chickens are alive and well. Well, four chickens and four roosters (because I’m just that good at selecting laying hens). We’ve also since gotten a dog. But just yesterday I saw the shadow of a hawk swoop across my yard and I ran out to warn my chickens and rouse our pup to action. But these smart and tough chickens had already run for cover. And I’ve grown fond of them again—-despite knowing their bloody savage past as cannibals. 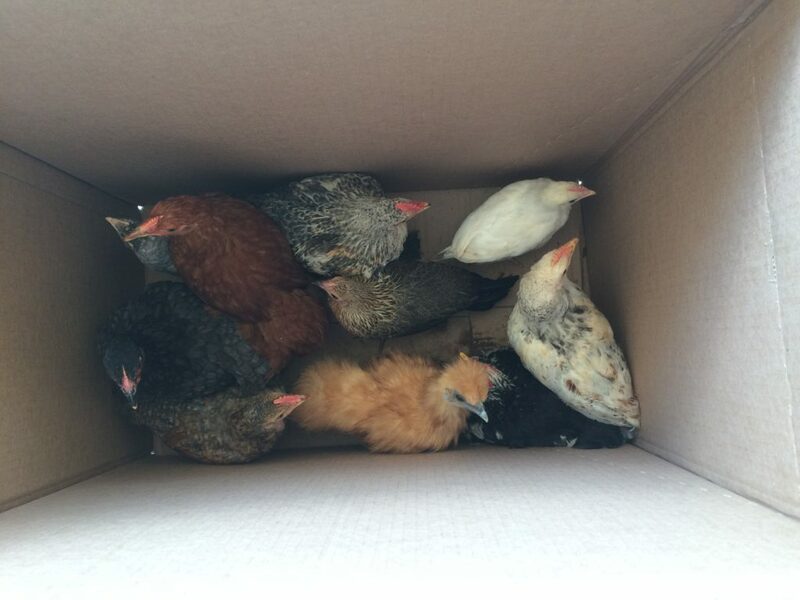 They all have personality and we call them Red, Whitey, Blackie, Freckles, Silkie, Dove, Monster and Monstress. I don’t know about the last two; don’t ask. And Freckles crows every morning and has to put up in the shed overnight by his lonesome—-where he poops on the riding lawnmower. Which brings me to this weekend’s chicken coop build. Because it might get cold this winter and I’m not cruel, but I’m also not going to lose my shed to a bunch of chickens. 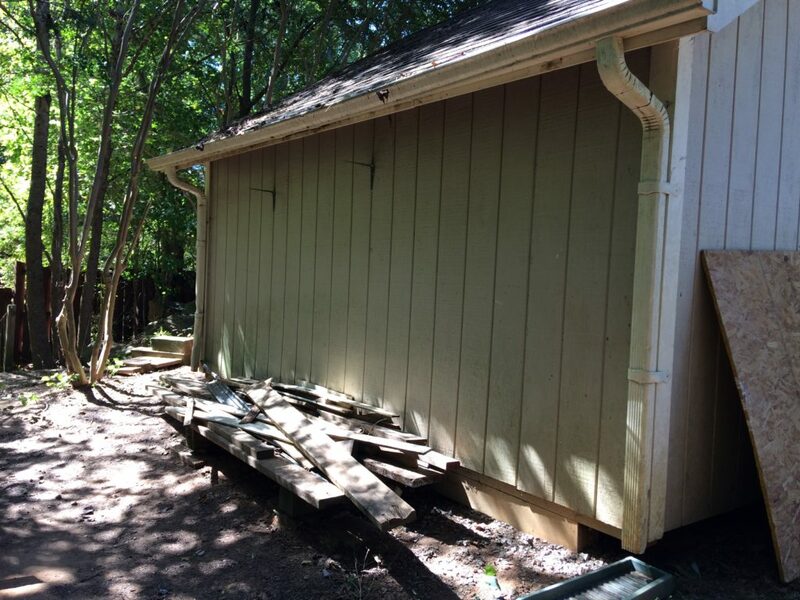 We’re building the coop lean-to style on the back of our existing building. And we’ve got some lumber I’m hoping to salvage. We had another project that took priority most of the day but here’s how far we’ve gotten. 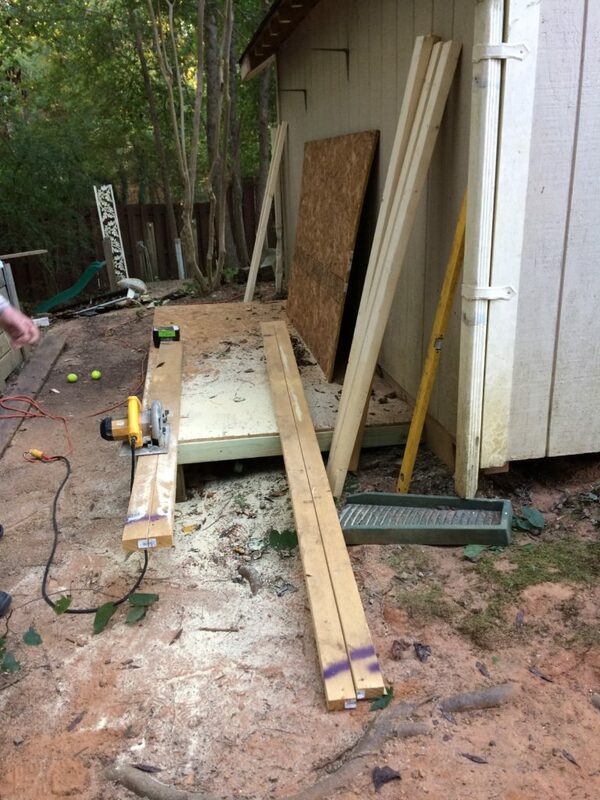 Our whiz handyman (using some existing wood) cut the lumber and constructed the floor frame in about an hour. 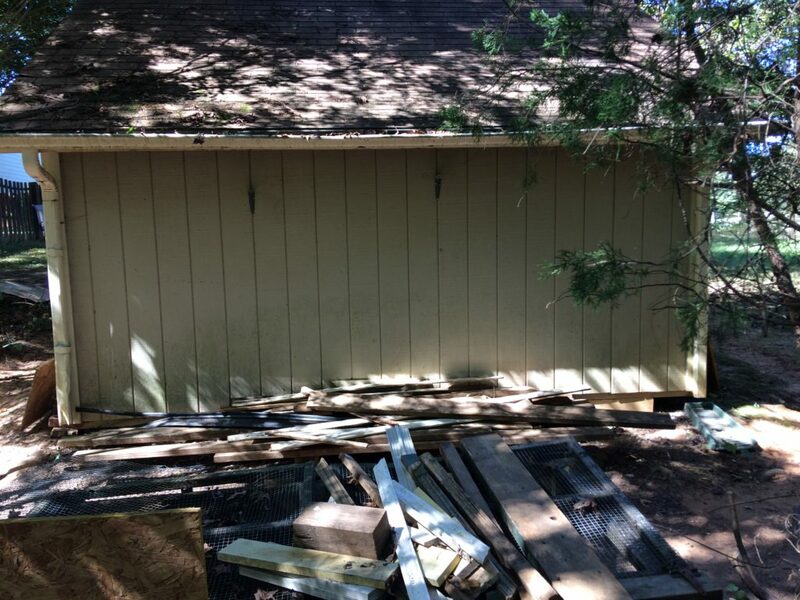 He spent the rest of daylight taking off the shed’s gutter to prepare for extending the roof and ripping wood for tomorrow. 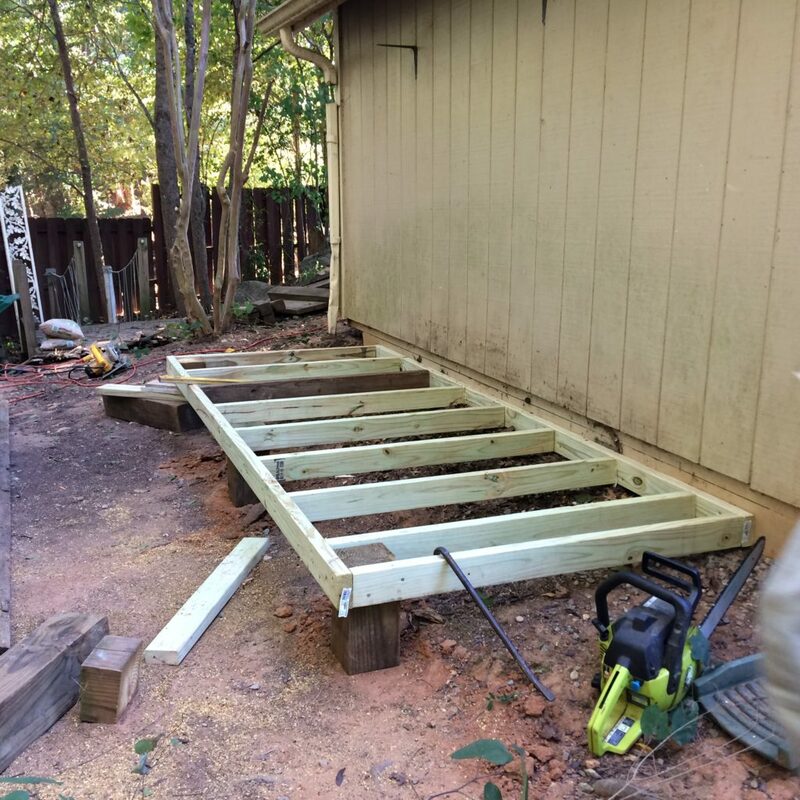 He trimmed down the joists to provide more headroom inside the coop. And we have a floor. I’ll update you when the walls go up. I’m so exited I could burst. Love your girls!! Keeping them safe can be exhausting, but boy, aren’t they so much fun?! Have you gotten any eggs, yet? Your site is fantastic! Yes!! Enough to share too! It’s been wonderful!